Catalina Council hosts various Supplemental Trainings throughout the year. These include: Wilderness First Aid, CPR, AED, Leave No Trace, Tread Lightly, Outdoor Ethics, BALOO, and others. Please use the Tabs above to see when the next training is available. PLEASE NOTE: Basic First Aid, CPR/BLS for the Professional and AED training are required for this course and must be current for two years. These courses may be take after wards yet Lifeguard training cannot be completed until they are current. In addition, there are two internships that are need to be completed. but is offered to interested Scouters. This is considered a Level V activity in the BSA Shooting Sports Manual (page 11). The cost of the course is $70.00. If you are wanting to renew and take the WFA and CPR refresher course you may, with the Cost of $45.00. If you currently still have your WFA Field Guide Book then the cost is $25.00. Note You must retake your refresher every two years to stay current otherwise you will need retake full course. For more information or questions contact John Longhofer at email: johnlonghofer@gmail.com cell phone: (520) 990-4442. 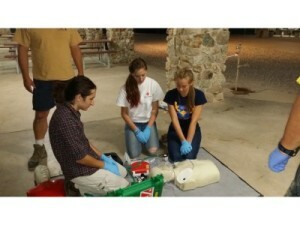 The Wilderness First Aid course is designed to introduce you to the concepts of medical care in a wilderness setting. The course focuses on skills, practice and realistic scenarios through hands-on skills and simulations to teach you scene and patient assessment, basic and advanced first aid techniques, CPR, AED and basic life support skills, minor trauma, environmental topics, allergic and toxic reactions, wound care, bandaging (classic and improvised), bone and joint injuries, splinting, head and spine injuries (assessment and decision making) and other “common” medical emergencies. Included in this course, you will also receive your basic CPR, AED and an introduction to O2 use as well. We provide two different length courses – 16-hour and 25-hour versions. The 16-hour course is ideal for Boy Scouts and adult leaders it gives you the skills and confidence you need to respond to an emergency when help may be delayed. Youth course participants must be at least 14-years-old, a First Class Scout and have completed their First Aid Merit Badge. Due to the serious nature of the course and scenarios a Scout needs to have a mature attitude. 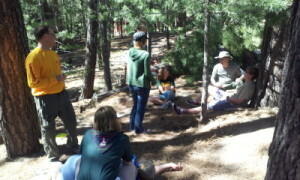 The 25-hour course is designed for Venturing Scouts working on their Ranger Award and their First Aid Elective. This course contains all the elements from the 16-hour course while adding more information that pertains to coed crews, scenario work and hands-on applications. The cost of the course is $70.00, when you register. Participants will receive: WFA Field Guide Book, Certification Card and Patch upon completion of course. This course is good for two years. WFA Refresher courses are 8 hours long. The cost is $45.00, when you register and must be done before your current certification expires. If you currently have a WFA Field Guide Book then the cost is $25.00. This course is being done through the Emergency Care and Safety Institute and/or American Safety and Health Institute. For more information and contact John Longhofer at email: johnlonghofer@gmail.com cell phone: (520) 990-4442. For more information and scheduling contact John Longhofer – ECSI and ASHI WFA, CPR/AED Instructor and Course Director at email:johnlonghofer@gmail.com cell phone: (520) 990-4442. This course needs a minimum of 6 participants. CPR and AED is for any Scout, adult leader or individual who has a job related to emergences and the care of others, those who are Emergency First Aid Responders, BSA Lifeguards and Aquatic and Watercraft Supervisors. When it is your duty to respond to cardiac or breathing emergencies until advanced medical personnel can take over. This is a hands-on course and will provide you the skills needed to recognize and care for many respiratory emergencies for infants, children and adults. This course is good for two years. This course is open to all Scouters and the to the general public. Must be 14 years old or older. Conduct Leave No Trace Awareness Workshops and may assist at Leave No Trace Trainer Courses. Schedule: Friday Check-in will begin at 5:00 PM on Friday and start at 6:00 PM, running until Saturday 7 PM. Participant MUST camp overnight and attend both sessions to complete the training. This course requires one overnight camping night on Friday night. Course Description: Participants will receive hands-on training in Leave No Trace skills, ethics, and the seven principles. Other related topics may be discussed. You will have to present a 10-minute “Leave No Trace” presentation/demonstration, to be coordinated before attendance and presented on Saturday. Master Educator for this course will be Mr. Joe Reilly. Copy of current Medical Form (returned upon completion of course, paper and pen. Water bottle, sunscreen, hat, closed-toe shoes, and flashlight. Please bring your own snacks and drinks if you have a special diet. If you have any food allergies or needs, please communicate. Personal camping equipment (tent, sleeping bag, cot, hammock, etc.) as needed. What will be provided: Training materials for the course, meals Friday crackerbarrel and Saturday (breakfast/lunch/dinner). Opportunity to purchase Leave No Trace Trainer materials, activities and Center Pro Shop items MAY be available at the end of the course. Recognition: Upon completion of the course, trainers will receive the Leave No Trace Trainer patch from the Leave No Trace Center for Outdoor Ethics, along with a course certificate. Boy Scout youths may wear the “Outdoor Ethics Guide” leadership patch, provided by your troop. Boy Scout adults and Venturing members may wear the “Leave No Trace Trainer strip. These may be available to purchase at the training session. Registration Deadline: Course contact is Cindy Reilly, Catalina Council OE Committee Vice Chair at: cdreilly.lnt@gmail.com. Course agenda and welcome letter will be sent out prior to the training, along with instructions for 10-minute presentation. Please sign up early to insure your reservation. Space limited. Fee: $40 ($25 of the fee is for Tread Lightly! Membership.) Sunday Lunch included. Participants completing this course will be certified as a Tread Lightly! Tread Trainer. A Tread Trainer is prepared to provide workshops to empower generations to enjoy the outdoors responsibly through stewardship and to further the goals of responsible and ethical recreation. This course is available for registered Scouters, Venture Scouts, and the general public. Must be 18 years old minimum. Please bring paper and pencil for note taking, water and snacks, sunblock, and wear close toe shoes. NOTE: Those who are taking the Leave No Trace course on Friday and Saturday, may camp over for this TreadLightly! Course. However, you shall provide your own food until lunchtime for this course. PREREQUISITES:Participants must complete BOTH Tread Lightly! And Leave No Trace online awareness courses prior to the class. Please bring the printed certificates from the online courses to class. Course Director: Joe Reilly (Master Tread Trainer), fjreilly63@gmail.com. Course agenda and welcome letter will be sent out prior to the training. Please sign up early to insure your reservation. “The Boy Scouts of America has adopted the principles of Leave No Trace, which are easy to learn and apply. Every outing and activity should be conducted with Leave No Trace in mind. As young people mature, we will enjoy an increasingly beautiful environment because of the impact of their training in Leave No Trace. As members of the Boy Scouts of America, we should be good stewards of our environment through knowledgeable use of resources. Outdoor Ethics is the umbrella term for how a Scout relates to the outdoors. The Outdoor Code is Scouting’s aspirational statement of Outdoor Ethics. To support the Outdoor Code with proven principles and skills, Scouting has incorporated Leave No Trace, for non-motorized outdoor activities, and Tread Lightly!, for motorized activities and shooting sports. TheLand Ethic challenges us to be committed to conservation and stewardship of our environment. This 3-4 hour class is designed to help youth and adults at all program levels to understand the general principles of Leave No Trace and how to apply them in the BSA outdoor program. It is also designed to give adults the confidence to assess youth understanding and skills when signing off on scout rank requirements or Venturing award requirements. Scouts or Scouters who have completed a Leave No Trace Trainer course may conduct this Awareness Seminar. This training is credited to individual BSA training records as an official BSA Training. Trainers conducting a BSA 101 Course should submit a Training Attendance Report to the Council Outdoor Ethics Advocate. Once approved the Advocate will return training certificates to the trainer and register the participants with the Council Training Committee and Council Registrar. This 16-hour, overnight course trains adults and youth ages 14 and up to serve as Leave No Trace Trainers. It is recommended training for the Outdoor Ethics Guide troop junior leadership position. It is also highly recommended for camp staff, members of the council and district outdoor program and training teams. The youth leaders of a busy outdoor adventure program must be able to apply Leave No Trace to a variety of activities in differing environments during all seasons of the year, all done in the company of Scouting youth and adults with varying levels of outdoor skills, self discipline and commitment to an outdoor ethic. Additionally, the course will provide participants with a deeper understanding of Leave No Trace to help individuals make and guide others in making good choices to minimize recreational impacts to help protect the wonderful outdoor locations they choose to enjoy. Individuals planning trips to National High Adventure Bases, Camp Staff members, Unit Leaders and those in District or Council training positions are urged to attend this course. This 5 days/nights course is for developing Master Educators who will instruct Leave No Trace Trainer Courses. The Tread Trainer program is designed to train participants in innovative, practical methods of spreading outdoor ethics to the public with a curriculum specifically focused on motorized and mechanized recreation. Once a participant becomes active in the Tread Trainer program he or she is equipped to present the Tread Lightly! message to other educators, clubs, employees, visitors, enthusiasts or community members. Tread Lightly! Master Tread Trainer course is a two-day course designed to provide an in-depth look at outdoor ethics focusing on motorized and mechanized recreation on both land and water. Participation in the course qualifies individuals to present the Tread Lightly! message consistently to others in their state or region. Contact Joe Reilly, Master Tread Trainer, at fjreilly63@gmail.com or 520-982-0982 for more information. Please contact the Council Outdoor Ethics Advocate for more information available. Other Trainer courses may be arranged for your unit or district with the approval of the Outdoor Ethics Advocate. If you have any questions, please don’t hesitate to the Council Outdoor Ethics Advocate. This over night course is designed as an introduction to the Boy Scout outdoor program. It is required for Scoutmasters and Crew Advisors to be considered Trained in their respective positions. IOLS is an instructor-led course which is conducted at the Council level. BSA’s Boy Scout level camping policies will be taught along with the necessary tools to help units carry out a successful camping experience.